Welsh wines are enjoying a boom with vineyards popping up all over the country, and they’re winning plenty of awards to boot. We find out more. Wine-making in Wales has risen 70% in the past decade, with production soaring to 100,000 bottles per year. And it turns out they’re pretty good too! In the past five years, Welsh vineyards have won dozens of awards for their crisp whites, rosés and sparkling wines. Among them is White Castle Vineyard. 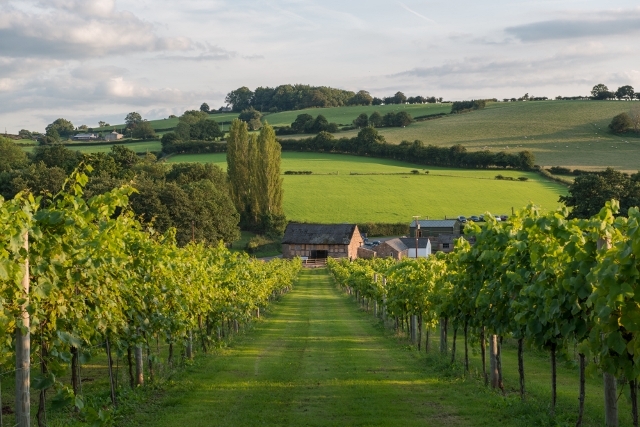 On five acres of south-facing slope, this Monmouthshire vineyard makes award-winning wines that include Gwin Gwyn: a dry, delicate white from a blend of Phoenix and Siegerrebe grape varieties, a light and fruity rosé and medium-bodied Rondo red. Check them out during the Festival with a vineyard tour and full wine tasting, where you can learn about the vineyard’s humble beginnings, and how they harvest, make and bottle their wines. A hotspot for wine-making, Abergavenny’s surrounding area is packed with winemakers, taking advantage of the county’s microclimate and soil. Around the corner is Sugarloaf Vineyards; set against a beautiful backdrop, selling crisp whites and pink sparkling wine. Or travel a little further to Tintern, where Wales’ longest established Parva Farm vineyard offers up their acclaimed Tintern Parva Bacchus. Head further west to Pembrokeshire and you’ll find Cwm Deri Vineyard; home to white grape vines, from Gold Riesling to Phoenix and red grape varieties, including Triomphe d’Alsace and Leon Millot. 100 metres above sea level, the vineyard produces up to 10 to 15 tonnes of grapes each year, and has expanded its range to include delicious fruit wines and full-bodied liqueurs. Head to this year’s Cheese and Wine Market for a taste of the real thing. With a relatively young wine industry, Wales is already making waves, attracting attention from winegrowers all over the world. We’re excited to see what the next decade has in store! For more inspiring UK winemakers at this year’s Festival, look out for Herefordshire’s Frome Valley Vineyard and their sparking, white and rosé wines, as well as Hawkins Bros Fine English Wines grown and made on the south-facing chalk of Surrey’s North Downs. See you there!